Baked Potatoes are one of the great comfort foods out there. These supereasy potatoes served with my mushroom mix and a super tasty sweet and chili cheese cream makes these bites not only easy and tasty but luxurious. I serve them just as they are and with some greens on the side or together with meat or poultry. Each of these options are equally delicious. It´s also a great meal if you have a lot of dinner or lunch guest over. You can quickly fill your oven with multiple ones at the same time. You can make the potatoes and the cheese cream in advance the night before, so when it´s time to eat just reheat your potatoes and cook your mushroom – just a 4 minutes task. Very convenient! 2 Baked Potatoes Cut in Half. 16 oz Mixed Mushrooms (I Used Baby Portobello Mushrooms, Yellow Chanterelles and Funnel Chanterelles In My Mix. But That Is Optional. Preheat oven to 435 degrees Fahrenheit (220 degrees Celsius). Cut potatoes length wise in half. Flip the potatoes over and slice of a small piece from the bottom of the potatoes to make the potatoes stand more stable on the baking tray. Bake the potatoes in oven for about 30 minutes or until fork tender. To prevent burning cover the potatoes with parchment paper, when the potatoes have reached a nice golden brown color. While the potatoes are cooking, prepare your mushroom filling and cheese cream. Cut your mixed mushrooms in to smaller pieces. I cut my portabello mushrooms and chanterelles into four pieces, to give you an idea how big they should be cut. I left my Funnel Chanterelles uncut. Cut the onion in two halves and slice the onion(s). Add the mushrooms in a large sauté pan and cook over moderately high heat. When all water has evaporated add the butter and onion slices. Toss to coat with butter. Press the garlic over the mushrooms with a garlic presser. Add soy sauce and sauté for about 3-4 minutes or until onions are soft and mushrooms are tender and golden. In a bowl mix sour cream, sweet chili sauce and cheese. 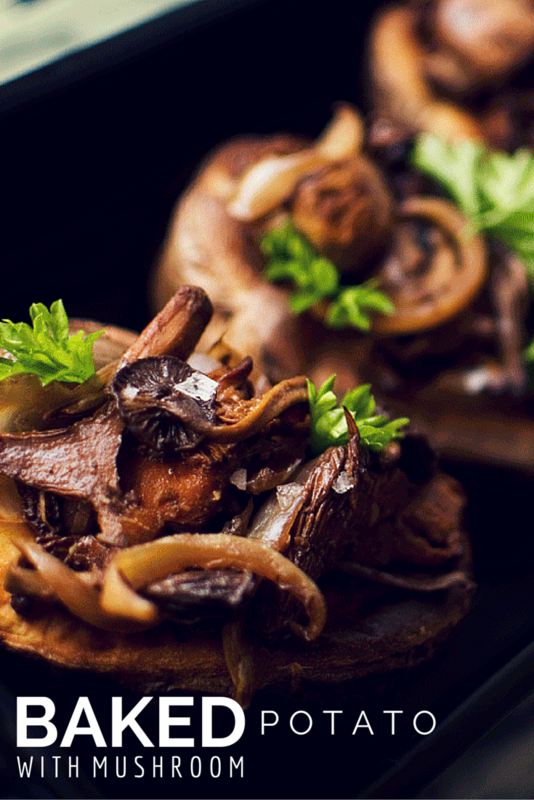 Serve mushroom mixture and cheese cream over the baked potatoes. Garnish with parsley and some black ground pepper. Looks amazing, thanks for sharing the recipe. I ordered all the ingredients from Mathem and plan to try it out mid-next week!